Melanoma maligna is one of the malignant skin cancers that spread rapidly and causes mortality. WHO noted there are at least 3,300 new melanoma cases happening every year in Indonesia. Melanoma can appear on normal skin or start from a mole. The change from a normal mole into melanoma is often not realized by the society. Concerned about this issue, several biology students of Universitas Gadjah Mada (UGM) tried to find an alternative solution to cure Melanoma maligna. 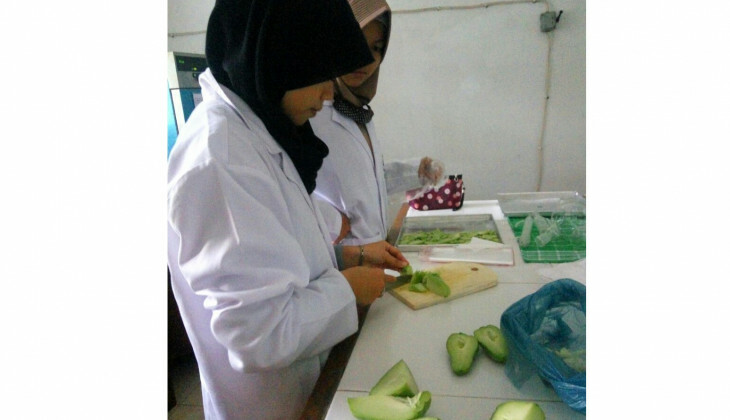 Dwi Jami Indah Nurhasanah, Bening Larasati, Dea Febiansi, and Dhella Apriliandha Roshitafandi tried to utilize chayote as an ingredient to make ointment as an alternative treatment for melanoma. Their research was conducted under the supervision of Dr. Budi Setyadi Daryono, M.Agr.Sc., Ph.D. through the Students Creativity Programme UGM 2017. Dwi Jami Indah said chayote is one of the agricultural crops in Indonesia. It is often cooked as a vegetable and consumed by the society. On the other hand, chayote skin has yet to be utilized as it contains latex that is beneficial for the health. “Chayote contains flavonoid and saponin compounds which are a secondary metabolite compound that can be utilized as anti-cancer,” said Indah on Wednesday (18/7) at Faculty of Biology UGM. In order to identify the anti-cancer compounds inside chayote, those students conducted an advanced research by performing qualitative and quantitative as well as anti proliferation tests using the line cell which has the same proliferation character as the cancer cell. They used chayote paste as the tested sample. They performed a thin layer chromatography test for the qualitative test and spectrophotometric test for the quantitative one. During those tests, chayote was divided into three parameters based on the fruit size. This was done with an assumption the bigger the size, the older the fruit. “The result from three parameters shows all of them contain saponin and flavonoid compounds,” said Indah. The research was continued with processing chayote into an extract. The extract was then made into ointment form. Based on the antiproliferative test, the result was positive. “The tested chayote extract can obstruct the cell’s growth,” she added. The production of chayote ointment for mole named as Selasih Lalat is one of the unique product innovations by Biology students UGM for Melanoma treatment. Moreover, it also aims to encourage the utilization of natural materials as an alternative medicine that is still rarely known by the society.